Not to be confused with Yser. The Isère (pronounced [izɛʁ]) is a river in the Auvergne-Rhône-Alpes region of southeastern France. Its source, a glacier known as the Sources de l'Isère, lies in the Vanoise National Park in the Graian Alps of Savoie, near the ski resort Val d'Isère on the border with Italy. An important left-bank tributary of the Rhône, the Isère merges with it a few kilometers north of Valence. Drainage basin of the Rhône (the Isère flows through Grenoble in the center of the map). The word Isara figures in the etymology of many other river names, from ancient Gaul and its neighboring lands. Examples of this are the Ésera in Spain, the Isar in Germany, the small Franco-Belgian Yser, or even the ancient name of the Oise, Isara (the French adjective isarien still exists in the language and continues to describe anything related to the Oise). In non-Celtic countries, we find the Isarco, a river in Northern Italy, the Éisra and Istrà in Lithuania, and the Jizera in the Czech Republic. The Isère's course measures 286 kilometers (178 miles) and runs through a wide variety of landscapes: from its source near the Italian border in the western Alps, it crosses the Pays de Savoie and the Tarentaise Valley, cuts between the Chartreuse and Belledonne mountain ranges, follows the Vercors Massif, passes through the Dauphiné province, and finally meets with the Rhône at the foot of the Vivarais. The upper valley of the Isère is called the Tarentaise, and its middle valley the Grésivaudan. The lower valley constitutes a section of the Plain of Valence [fr] (also called the Valentinois) and is characterized by the river's deep, winding channel. Instead of widening its banks over time, the Isère has dug deeper into its bed, forming stepped fluvial terraces. The valley has clearly defined borders and is relatively narrow, not exceeding 2 km (1.2 mi) in breadth. The repetition of alluvial deposition (during periods of Quaternary glaciation) and overdeepening (during interglacial periods), known as a fluvioglacial system, led to the formation of several stepped terraces in the lower Isère valley, like the one on which Saint-Marcel-lès-Valence is built. This occurred through the massive accumulation of alluvium from the Isère on top of a bed of Miocene molasse. Today, these terraces still define the geography of the Plain of Valence. The Isère initially merges with one of the Rhône's diversion canals, built for navigational purposes, at Pont-de-l'Isère. At the southern tip of La Roche-de-Glun (a commune on an island formed by the canal), the Isère Dam drains part of the water back into the Rhône and permits the Isère to continue its course alone until it passes through the Bourg-lès-Valence Dam and reaches its final junction with the Rhône. (L) Left-bank tributary; (R) Right-bank tributary. Lengthwise profile of the Isère. Vertical: NGF altitude (m). Horizontal: distance from the mouth of the river (km). The length of the Isère is 286 km (178 mi), and its drainage basin covers 11,890 km2 (4,590 sq mi). From its sources to Sainte-Foy-Tarentaise (except for those sources having a slope of around 25%), the average slope of the Isère is 5.1%, in a more or less confined valley (forests, gorges, and higher up, grasslands). As far as Moûtiers, the slope measures 1.18%. Before the river's confluence with the Arly, its slope is only 0.53%. The slope decreases to 0.136% until Grenoble. Downstream from Grenoble, it measures 0.1%. The flow of the Isère was observed over a period of 58 years (between 1956 and 2015) at Beaumont-Monteux in the Drôme department, situated near the river's confluence with the Rhône. The discharge of the river at Beaumont-Monteux measured 329 cubic meters per second (11,600 cubic feet per second). The Isère's large seasonal fluctuations are typical of rivers fed in large part by snowmelt, with springtime flooding raising the average monthly discharge between 382 (13,500) and 500 m3/s (18,000 cu ft/s) from April to July (peaking in May and June), and low water levels in autumn and winter, from August to February, with a minimum average monthly discharge of 246 m3/s (8,700 cu ft/s) in September. Generally speaking, this makes the Isère a very plentiful watercourse throughout the year. However, the VCN3 [fr] can drop to 110 m3/s (3,900 cu ft/s) during a five-year dry spell, which is very low. On the other hand, severe flooding can result from rapid thaw or torrential autumn rain. In fact, QIX 2 [fr] and QIX 5 are 1,200 (42,000) and 1,500 m3/s (53,000 cu ft/s), respectively. QIX 10 is 1,700 m3/s (60,000 cu ft/s). QIX 20 reaches 1,900 m3/s (67,000 cu ft/s), while QIX 50 rises to 2,200 m3/s (78,000 cu ft/s), which is still moderate compared to other rivers in the south of France, like the Tarn. The highest instantaneous discharge on record was 2,050 m3/s (72,000 cu ft/s) on September 16, 1960, while the highest daily value was 1,510 m3/s (53,000 cu ft/s) on October 7 of the same year. The depth of runoff for the Isère's drainage basin is 882 millimeters (34.7 inches) annually, which is quite high above France's average and clearly superior to that of the Rhône's drainage basin (666 mm (26.2 in) in Valence for a surface area of 66,450 km2 (25,660 sq mi)). The specific discharge is 27.9 liters per second per square kilometer of drainage basin. The Isère from La Daille, near Val-d'Isère. Moûtiers: the Isère and the cathedral. The bridge on the Isère at Montmélian. 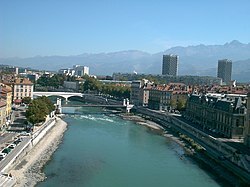 Wikimedia Commons has media related to Isère River. ^ a b c d Sandre. "Fiche cours d'eau - Isère (W---0000)". Retrieved 24 March 2015. ^ a b c d e f g "Synthèse : L'Isère à Beaumont-Monteux". Banque Hydro [fr] (in French). Eaufrance. Retrieved 25 March 2015. ^ "ISARA / ISAROS (ISÈRE)". Encyclopédie de l'Arbre Celtique (in French). Guillaume Roussel. 2009. Retrieved 24 March 2015. ^ a b c Delamarre, Xavier (2003). Dictionnaire de la langue gauloise : une approche linguistique du vieux-celtique continental [Dictionary of the Gallic Language: A Linguistic Approach to Continental Old Celtic]. Collection des Hespérides (in French) (Revised and augmented 2nd ed.). Paris: Errance. p. 191. ISBN 978-2-87772-369-5. OCLC 354152038. ^ Ravit, Philippe (2007). Le paysage valentinois, de la fondation de la colonie de Valentia (Valence) au IIIème siècle ap. J.-C. (Dissertation) (in French). Université Jean Moulin Lyon 3. p. 202. ^ Delahaye, Emmanuelle (23 January 2009). "Chapter 2.1.2., page 'Caractéristiques topographiques : au-dessus du fleuve'". Les espaces fluvio-urbains rhodaniens à l’aval de Lyon, Vienne, Valence, Avignon, Tarascon, Beaucaire et Arles : des territoires à la dérive ? [Urban river spaces along the Rhône downstream of Lyon, Vienne, Valence, Avignon, Tarascon, Beaucaire and Arles: territories left to drift?] (Thesis) (in French). Université Lumière Lyon 2. Retrieved 25 March 2015. ^ Faucher, Daniel (1914). "La plaine de Valence (Bas-Dauphiné)" [The Plain of Valence (Lower Dauphiné)]. Annales de Géographie (in French). Armand Colin. 23 (128): 127–128. doi:10.3406/geo.1914.8134. ISSN 0003-4010. Retrieved 20 March 2015 – via Persée. ^ The starting point is at 2,341 m, near the Prariond Refuge. The ending point is situated just downstream of Villaroger. ^ "Le Rhône à Valence" [The Rhône at Valence] (PDF). Banque Hydro (in French). Eaufrance. 8 March 2015. Retrieved 25 March 2015.